PROSECUTORS ROUTINELY reduce criminal charges or waive them altogether. They agree to plea bargains. They settle misdemeanor cases in exchange for compensation to the victim. Under our legal system, the government's prosecuting attorneys have extraordinary leeway in deciding whom to prosecute, and for which offenses, and what punishment to seek. 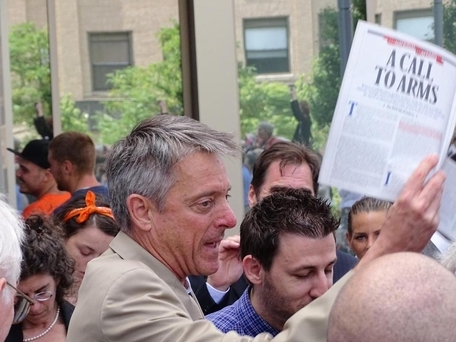 Before a crowd outside the courthouse, District Attorney Sam Sutter waves a manifesto published in Rolling Stone by a well-known climate alarmist, Bill McKibben. "You know where my heart is," the DA declared. So when Sam Sutter, the district attorney for Bristol County, announced last week that he would drop the criminal charges pending against two global-warming activists for illegally blocking a shipment of coal to a power plant in Somerset, Mass., he was exercising prosecutorial discretion — something DAs do every day. Clearly, that's not why it made news. Nor is it why Sutter is being hailed — wrongly — as a hero on the environmental left. Sutter made his announcement moments before Jay O'Hara and Ken Ward were to go on trial for their stunt in Somerset, for which they faced charges that included conspiracy to commit a crime, disorderly conduct, and negligent operation of a motor vessel. Conviction could have meant up to nine months' imprisonment. The defendants didn't deny their actions; they said they were willing to go to jail in order to protest the burning of coal and what they regard as the government's "terrible" climate policies. "If I was convicted by a jury of my peers," O'Hara said in a radio interview, "I was ready and prepared to face the consequences of my action, knowing that that … is the sort of commitment that changes hearts when people see other people put their lives on the line for something that really matters." The defendants had planned to invoke a so-called "necessity" defense, arguing that though they broke the law when they blocked the shipping channel, they did so to prevent a greater harm — i.e., climate change. But instead of proceeding to a jury trial, Sutter dropped the charges at the last minute. O'Hara and Ward were merely required to pay $4,000 as civil restitution to the town of Somerset for its costs. Reasonable people can debate whether the protesters' blockade was a noble gesture of civil disobedience or merely obnoxious grandstanding, and whether their "coal is stupid" campaign reflects scientific thinking or crackpot hysteria. Did it make more sense to let them off with a monetary payment, rather than indulging them in what they hoped to turn into a high-profile trial of government policy and the morality of using fossil fuels? On that too there could be room for debate. But Sutter went way beyond the ethical bounds of prosecutorial discretion. He announced, in a manner calculated to attract maximum publicity, that he was letting O'Hara and Ward off the hook because he agrees with their political views. "Climate change is one of the gravest crises our planet has ever faced," Sutter declaimed to a cheering crowd outside Fall River District Court. "In my humble opinion, the political leadership on this issue has been sorely lacking…. This symbolizes our commitment, at the Bristol County district attorney's office, to take a leadership role on this issue." And to be sure no one missed the nakedly ideological character of his action, Sutter said he would "certainly" take part in a global-warming protest march planned for Sept. 21 in New York City. He held aloft a manifesto published in Rolling Stone by a well-known climate alarmist, Bill McKibben. "How do you like that?" Sutter called to the crowd. "So you know where my heart is." The DA's behavior was worse than disgraceful, it was dangerous. It was an egregious abuse of his authority as a prosecutor: not that he dropped the charges against two lawbreaking protesters, but that he did so because he wants to promote their controversial cause — and to promote his own "leadership" on the issue. 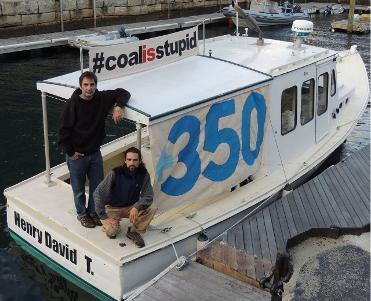 Climate activists Jay O'Hara and Ken Ward aboard the vessel they used to block the delivery of 40,000 tons of coal to a power plant in Somerset, Mass. Sutter isn't the first DA to misuse his prosecutorial discretion because he sympathizes with a criminal's outlook. "During the civil rights era," notes the Southern Poverty Law Center, "white prosecutors in Southern towns notoriously refused to bring charges against whites for racially based hate crimes against African Americans — even when the evidence in favor of prosecution was overwhelming." It may be tempting for those who see climate change as a crisis to applaud Sutter's overtly political decision. Would they feel the same way about an anti-abortion DA who refused to prosecute demonstrators for blockading a Planned Parenthood clinic? Would they cheer a prosecutor whose antipathy to Islam led him to drop the charges against trespassers preventing construction of a mosque, and then to trumpet his "leadership" in doing so? Prosecutors aren't elected to make public policy — not on fossil fuels, or civil rights, or abortion, or anything else. Their job is to enforce the law, not to enact it. What Sutter did was contemptible, not commendable, and no one should have been cheering.